Image caption "I don't collude with Russia," Mr Trump said on Friday. US President Donald Trump has said he feels "very bad" for his ex-campaign manager Paul Manafort, a day after he was sentenced to a prison term. 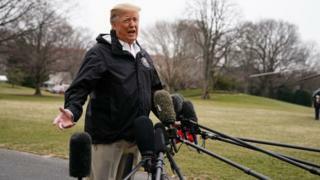 Mr Trump erroneously told reporters the judge in the case had said there was no collusion between the Trump campaign and Russia. "It's a collusion witch hoax," the Republican president said as he left the White House. Manafort, 69, was found guilty of tax and bank fraud. Heading off to see tornado damage in the US state of Alabama, the president again denied his campaign had colluded with Russia to influence the 2016 White House election. "I feel very badly for Paul Manafort," Mr Trump told reporters. "I think it's been a very, very tough time for him." Former lobbyist Manafort was convicted last year of hiding from US tax authorities $55m (£42m) that he was paid for political consulting on behalf of pro-Russia politicians in Ukraine. At a federal court in Alexandria, Virginia, he was sentenced to 47 months in prison and told to pay $24m in restitution and a $50,000 fine. Manafort is due to be sentenced in another case next week related to his illegal lobbying. During Thursday's sentencing, Judge TS Ellis told the hearing: "He [Manafort] is not before the court for anything having to do with colluding with the Russian government." That led to Mr Trump claiming vindication on Friday morning, wrongly asserting that the judge had gone further and ruled out any collusion. The Republican president told reporters he felt "very honoured" by the comments. "The judge said there was no collusion with Russia," said Mr Trump. "This had nothing to do with collusion. "There is no collusion. It's a collusion hoax, it's a collusion witch hoax." "I don't collude with Russia," he added. It's hard to call a four-year sentence a slap on the wrist, but given that Paul Manafort was facing a possible 24 years in prison, he dodged a big bullet on Thursday. The former Trump campaign chair's legal jeopardy isn't over, of course. There's another round of sentencing - before a seemingly less sympathetic judge - in a week. Then all eyes will turn to the president and whether he will issue a pardon for his former aide. The language Donald Trump used in describing Manafort on Friday - that he feels badly for him and he's had a "very, very tough time" - is similar to sentiment the president has expressed before previous pardons. A lighter Manafort sentence might make it easier for the president to paint the prosecution as overzealous and Manafort as worthy of clemency. This won't be the end, however. Reports are that New York prosecutors are preparing state tax and financial fraud charges against Manafort. Convictions there would be beyond the president's power to forgive which only extend to federal sentences. Manafort, and the Trump White House, won a public relations victory on Thursday. That will be cold comfort for the formerly high-rolling lobbyist if he still spends the rest of his life in prison. Maine Independent Senator Angus King pushed back on the president's claim on Friday, telling CNN: "This case doesn't prove there was no collusion because that wasn't the subject of the trial." Manafort is one of six former Trump aides who have been indicted by US Department of Justice Special Counsel Robert Mueller's inquiry. They have been charged with lying to authorities, among other counts, but none has been prosecuted for any plot to subvert American democracy. After a 22-month investigation, the special counsel is expected soon to submit his report to the US attorney general. Who's who in the Russia-Trump inquiry? The political world is feverishly anticipating findings on whether the Trump campaign conspired with Russia, or if Mr Trump himself unlawfully sought to obstruct the inquiry. Manafort's sentence was far shorter than the 19-24 years outlined in sentencing guidelines by the special counsel's office, leading many to cry foul about leniency. But the president's lawyer Rudy Giuliani said Manafort had been treated harshly. "They should be ashamed of their horrendous treatment of Paul Manafort," Mr Giuliani said in a text message to a PBS reporter on Friday. He said Mr Mueller's investigators had pressured Manafort relentlessly because "he wouldn't lie for them".